Bunny agility competitions?! Have you ever heard of a cuter hobby?! (That’s a trick question because obviously you haven’t.) Read on for Christine’s story of training bunnies! My name is Christine Laikuen Laube. I was born and raised in St. Louis Park, MN (suburb of Minneapolis). I am a microbiologist working in business development at a contract testing lab. We help clients perform testing for registration of antimicrobial products. I enjoy cooking, biking, downhill skiing and volunteering with animals. Recently, I started learning English horse riding. I love spending time with my two Holland Lop bunnies, Rev and Axela! I am 31-years-old and my rabbits are 8 year old litter mates. My husband Jason and I (then boyfriend) adopted them when they were about 12 weeks old. For those of us who don’t know, what is animal agility training? Most people have heard of dog agility as a sport where a handler trains their dogs to run an obstacle course with jumps, tunnels, ramps, etc. 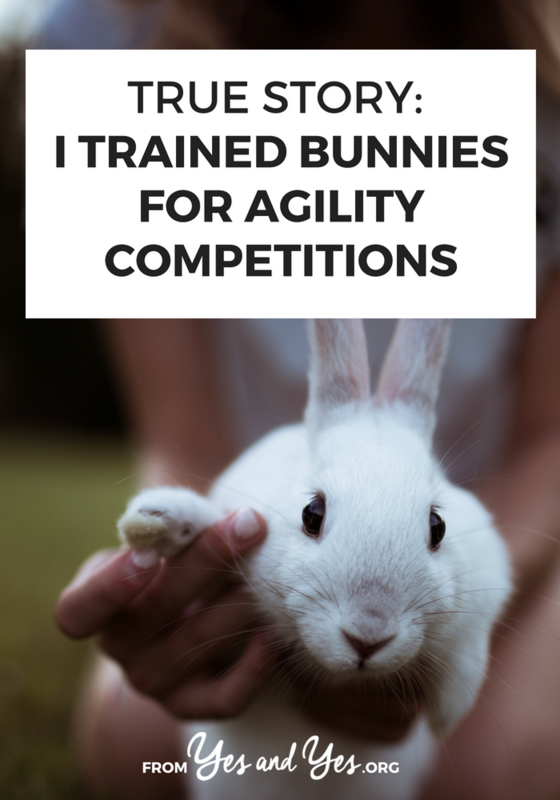 Rabbit Agility is pretty much the same as dog agility, but being that rabbits are prey animals we use training techniques that are similar to horse training. We begin training with rabbits on a harness/leash and get them accustomed to walking with the guidance of the handler. We gradually add obstacles and increase the difficulty with each class and band level. How did you get into training rabbits? When we first adopted Rev and Axela, I was living with my parents. We “bunny proofed” my bedroom by hiding cables and adding a kiddie gate. Once they were a bit older and stronger, we found that they would escape the kiddie gate in the middle of the night. The bars of the gate were too small for them to squeeze through, so they must have jumped over it. We eventually installed a webcam in my room so that we could check in on them while we were at work during the day. We caught them jumping the gate and also jumping on my bed. So we knew we had some active bunnies. We initially heard about rabbit agility through the Minnesota Companion Rabbit Society who I was volunteering for. A woman named Dell Robins had began teaching at the local Animal Humane Society. We thought that both Rev and Axela would love Agility since they escape our kiddie gate and jump on furniture all the time and after a few classes they were hooked. I think most of us are accustomed to seeing trained dogs – how does one train a bunny? Learning the obstacles is relatively similar to Dog Agility but getting your rabbit accustomed to Agility requires they feel safe, once they feel safe they learn much faster than dogs. Dell’s background in horse training was major part of her success with training bunnies.We start by getting the rabbit properly fitted with a harness and accustomed with wearing a harness and leash. We teach the handler to use clicker training so they can guide their rabbit to go where they would like them to go. We use a series of foot cues and voice cues to guide them through an obstacle course. As they graduate from each band level, the rabbit is able to accomplish more difficult obstacles with the ultimate goal of going off leash with voice commands only. Are there certain breeds that are easier to train? Rabbits have historically been breed for look and not behavioral traits, so behavior can vary from rabbit to rabbit no matter what breed they are. I would say that any rabbit that is motivated by food and treats would do well in agility. Even rabbits that are motivated by a reward of some kind, like praise or allowing them free time, would do well in agility. For example, Rev and Axela simply won’t take treats in Agility…they do it for fun. In fact at the end of an Agility session it is hard to get them to stop running the obstacles on their own. Tell us about your smartest, best-trained rabbit! Personally, I think all bunnies are pretty smart, the key is getting them to feel comfortable with the environment and their trainer. I have had a few handlers and their bunnies reach the highest band level and start to train their bunnies off leash. Axela and Rev had been in the class for a long time, became very advanced. Rev is great with the high jump and Axela can go off-leash on any course. Do you take your rabbits to agility competitions? Dell had hosted a few competitions. There were three different levels that the handler and rabbits could compete in. The first level was easy, where anyone that has never taken a class in agility could compete in. Medium had some basic obstacles, shorter jumps, tunnels and ramps. Hard was the most difficult and had more advanced obstacles (higher jumps, teeter-totter, water jump, tire swing, curved tunnels, etc. ).Each level was broken up into two courses (straight and curved). The straight course was just a long line of obstacles, where the rabbit would run one obstacle to the next in a straight line. The curved obstacle was often snaked through the room so that rabbit would have to turn left or right to go the next obstacle. The competitions were judged on speed as well as clearance of each obstacle. There was a high jump competition where we would line up the rabbits like in a limbo line and had them jump incrementally higher with each round. Axela won a first place ribbon for the most advanced curved obstacle course. After she won Jason had her run the course off leash, she completed the course perfectly to the crowd’s amazement, the only fault was she didn’t stop at the end and started running the course again! What have you learned from all this training? I learned that rabbits are exceptionally smart animals who can communicate in so many different ways when you spend lots of time with them and get to know them. Through agility, we teach the students that you can do so many fun things with your rabbit and you enjoy your time which each other even more. Rabbits have generally been known as cage pets and unfortunately are designated as poultry, but they are a valuable and loving companion when you let them free roam your home (much like a cat or dog), play with them, and train them. We have seen much stronger bonds between the students and their rabbits as they continue on in Agility. I learned that my love for rabbits extends beyond Rev and Axela and the classes that I teach. I have since developed an even deeper passion for all animals and learning more about animal conservation work around the globe. With Rabbit Agility, I would love to one day carry on Dell’s dream of creating web based classes and an international organization so anyone and anywhere can take classes, learn agility, and spread the understanding that rabbits are amazing companion animals. Thanks so much for sharing your story, Christine! Do you have any questions for her? This was so interesting! I absolutely love bunnies & I've always thought they were really smart. Oh my goodness, this is a thing?! I can't believe I've never heard of this. I had a bunny for 9 years named Pepsi. He won me plenty of blue ribbons and trophies in 4-H, even though I wanted a dog instead. My mom loved that little rabbit. I was a bit more hesitant with him (he bit me a few times). When we would let him run around our huge backyard, he would get so excited he'd flip and do sideways kicks. I really don't know how else to describe his behavior, other than we could tell he was excited/enjoying himself. Rabbits are one of those animals that everybody inherently thinks are adorable. Just look at them! This is so awesome, I never even know this job existed! This is adorable and I can't believe it's a real thing! I wonder how they train the bunnies to not go to the bathroom in their house. I've had my bunny Ralph for a year and a half, and while I knew rabbits were smart and could learn a few tricks, I had no idea that it was to this extent! I'll have to see what else Ralph wants to do now. Great interview! How the heck did I not know that this existed. I have two buns and I think they would love this. I love this so much! I have a super hyper Himalayan bunny (who is currently "digging a hole" in an old sheet). He'd probably benefit from agility training, but we don't have that available in our area. I would totally sign up for Christine's online classes! I loooooved it when my bunny would 'dig holes' in a laundry basket of clothes. So funny! This is so cute and interesting! I had no ideas bunnies could be trained for agility competitions. They look like they are having so much fun!! Bunny training?! Adorable! Such an interesting job! bunniez are teh awesome because they can combine incredible cuteness with terrible bada** attitudes. I love how haughty and disapproving they can be, it cracks me up. I had a Dwarf Lop named Sam who woudl "comb" his droopy ears as though they where strands of long hair. Tooo funny.